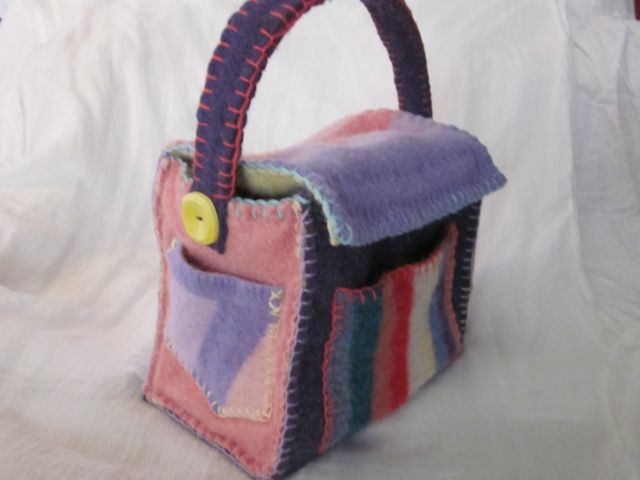 Lambswool and cashmere felted and semi-felted sweaters, stitched and decorated entirely by hand, a labor of love for a child or grandchild. 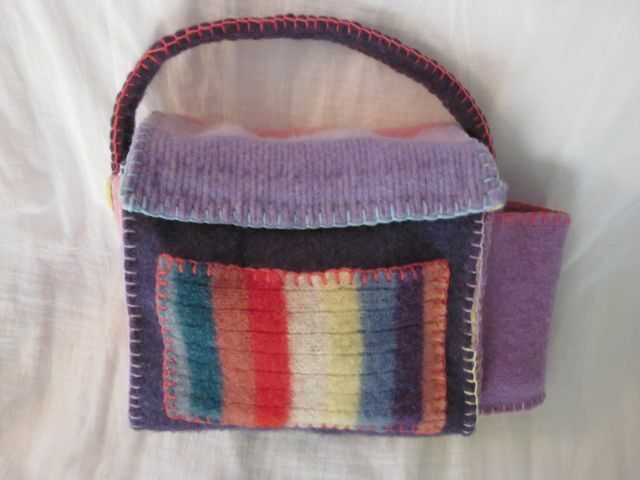 This playful and colorful lunchbox helps keep contents warm or cold. There is a container for a stainless steel bottle on one side, and pockets on the front and on the other side. The bag may also be used for toting things other than lunch. 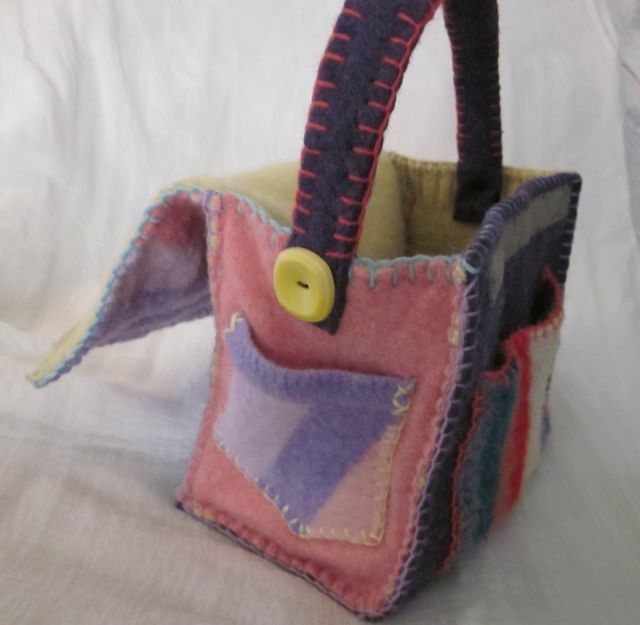 It is approximately 8 1/2″ wide (not including the bottle holder), by 7″ tall, by 4 1/2″ deep. Lunchbox open. The flap is held shut with hook and loop tape. Lunchbox pockets on front and side. 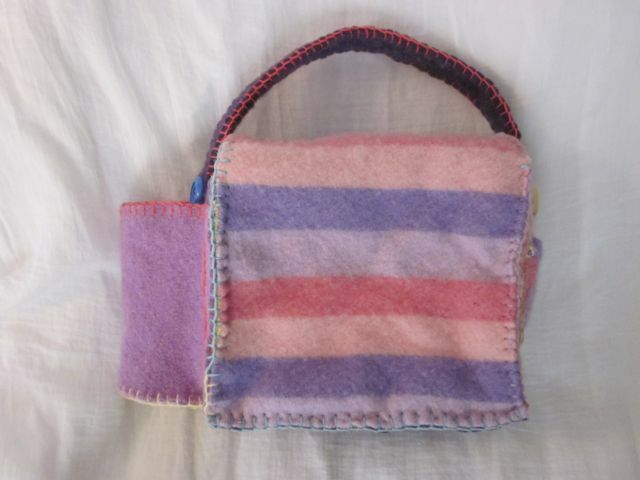 This entry was posted in Bags, Felted sweaters, Fiber Art, Handmade, Lunchbox, Repurposed, Sewing, Textile Art, Upcycled and tagged Fabric Art, Felted Sweaters, Felted Wool, For children, Handmade, Recycled, Repurposed, Sewing, Upcycled by Katharine. Bookmark the permalink. This came out beautifully! Have you thought about an Esty site? I bet these would sell like hot cakes on there. I do have an Etsy account, but have not yet set up my store. Maybe in the spring! Hum. I’m happy to get back here and see this. Something must be wrong with my subscription account because this was not updated, nor was I informed you posted this. I’ll check into it. Perhaps I’ll have to unsubscribe and then resubscribe. Anyhow, as to this lunch box, IT’S ADORABLE! It’s very whimsical and I love the colors. And of course, I appreciate all the handwork and especially the recycling that went into this. Sharon is right. These would sell like hotcakes. Thanks, Patsye. 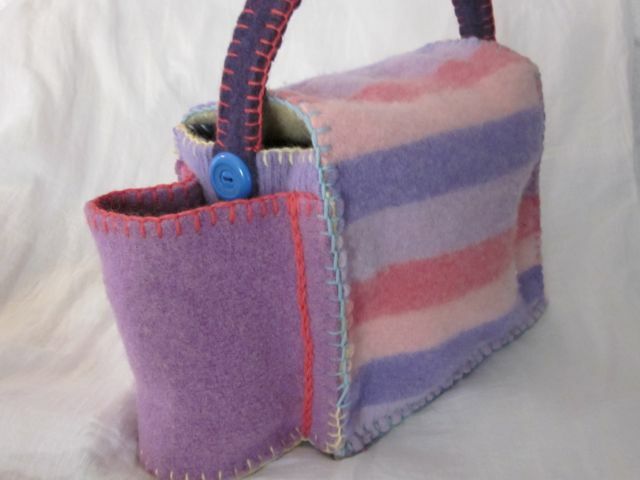 I like the sewing box idea. Needles and pins would find an easy home in the felt.